For its time period, the takedown pin disassembly method for the AR was revolutionary. With a carry handle on top of the early receiver, field stripping an AR was more like opening a suitcase, than a military weapon. Pushing out the takedown pin opened the rear of the receiver for inspection and cleaning. Pushing both AR-15 takedown and pivot pins allowed it to be reduced to a very concealable package. But installing and removing the takedown required a tool. A pin punch is a preferred tool. More often, in the field, a cartridge was the usual tool. But field expediency often saw the use of pens, keys, twigs, and as some will claim, the occasional swizzle stick. Of course, such was the beauty of the AR design, that all these improvised tools would work. The problem was, you had to have such a tool ready at hand when you needed it. 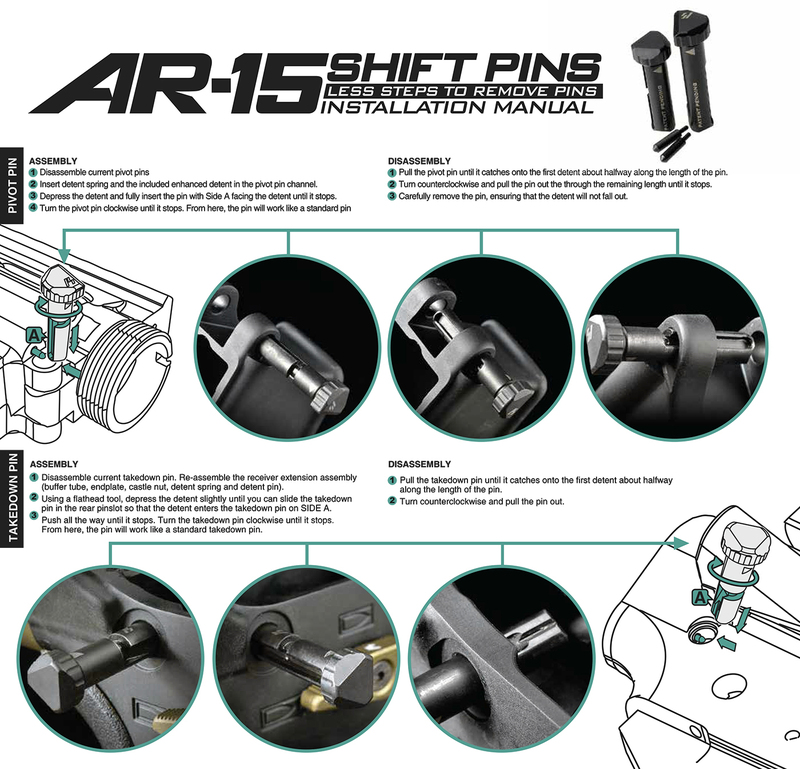 Installing Strike Industries Shift Pins means you will need no special tools to take down your AR. No tools needed means no tools you have to look for and no tools you might drop. even after you’ve found them. That’s something worth considering for dark and stormy nights. Unlike Mil-Spec and some aftermarket pins, Strike Industries Shift Pins have an angular, not a round head. Their flat surfaces are easy to grip. All it takes to remove them is finger pressure. CNC machined from steel, Strike Industries AR-15 takedown pins fit Mil-Spec and many billet receivers.